29 July has come and gone, taking with it your last chance for a free upgrade to Windows 10 - or maybe not. Ghacks has pointed out that Microsoft is still enabling free upgrades for some users. Anyone who uses assistive technologies like screen readers (or is willing to fib and say they use it) can visit a certain page on Microsoft's website and download an program which will upgrade their Win7, Win8 computer to Windows 10. Microsoft may modify or rescind the offer at any time, so if you want to upgrade to Windows 10 for free then you should check out this offer as soon as possible. To get started, visit the link below and then click Upgrade Now after you reach the MS website. As we shared earlier, we've extended the free upgrade offer for those who use assistive technology as we continue to make accessibility improvements to Windows 10, including many coming in the Anniversary Update, which is available after the free upgrade offer ends. See the Microsoft Accessibility blog here for more details. We are not restricting the free upgrade offer to specific assistive technologies. 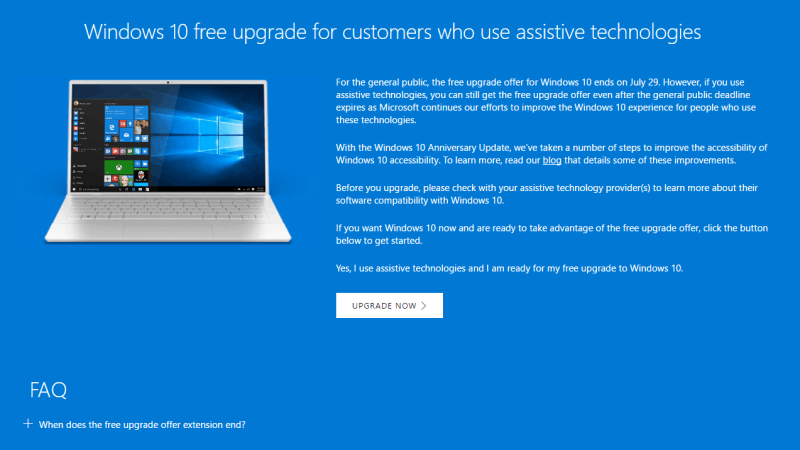 If you use assistive technology on Windows, you are eligible for the free upgrade offer. That said, it is not intended to be a workaround for people who don't use assistive technology and who missed the deadline for the free offer. There is no such thing as an upgrade to Windows 10. That would imply that there is an operating system out there that is worse. Microsoft’s price of “free” is still too much for all the downsides it brings.